The Official Blog of Media Works Ltd.
Twitter’s popular Vine app announced this week that it will now be available on Android operating systems. This newly poplar 6-second looping video application began back in January on Apple iOS and I can attest based on my own experience with a 12-year old son that it’s the hottest new form of social media today. Consumers looking to target teens (and parents of teens) should keep their eye on The Vine. Similar to Instagram, this app allows users to create a series of short video clips with their friends. As more and more adults become social media gurus, the teen generation has migrated away from the traditional Facebook, Twitter and YouTube’s of the world and find them no longer “cool”. According to a new study called The Pew Internet and American Life‘s new study, “Teens, Social Media, and Privacy,” teens “have waning enthusiasm for Facebook, disliking the increasing adult presence, people sharing excessively, and stressful ‘drama,’. Like Twitter celebrities are catching on with The Vine and you can follow top celebrity videos on The Vine from Snoop Dog, Soulja Boy, Pretty Little Liars star Lucy Hale, and even Jimmy Fallon and Tyra Banks! Some brands adopted The Vine early on; Wheat Thins, GE and candy brand Red Vines have all run Promoted Tweets with Vine videos. Also reported in Mobile Marketer, Dunkin’ Donuts, recently launched a contest on the Vine requesting fans to take a post a video of how their iced coffee puts “a spring in their step.” The advent of the 6-second video is making :60 second, :30 second and even :15 second commercials units of the dark ages. 1) Doritos – Frito-Lay brand used the official Mariachi Doritos band they performed a mystery tune to get brand fans to play along. 2) Taco Bell – promoted their new Cool Ranch Dorito Taco. 5) Urban Outfitters teamed with Converse to get Chuck-lovers to submit 6-second video diaries of their adventures with these popular shoes. The best #yourchucks entries won prizes such as free sneakers or a trip to San Francisco. In May The Vine was No. 1 on the Apple App Store with over 13 million users. The question remains of its longevity, however considering the appeal to the teen generation its popularity is likely to be short lived as trends wear quickly. Only time will tell and as a media specialist this is why our jobs are so much more difficult today. The consumer media vehicles are so diverse and constantly changing. By the time I figure this out I’m sure there will be something new. Rush Limbaugh, conservative talk show host, is scrambling to survive following his comments towards Georgetown law student Sandra Fluke, who spoke about contraception on Capitol Hill. The numbers are flying in regard to how many of his advertisers have jumped ship. Reports have mentioned as many as 42 , including national brands such as JC Penney, Capital One, Netflix, ProFlowers, Sleep Number and Quicken Loans. Yesterday it was reported that a total of 86 ads ran during the WABC broadcast of his show, of which 77 or roughly 90% were public service announcements. In addition, there was 5:33 minutes of dead air! Only 9 paid advertisers aired and of them, 7 have stated that they will take future steps to ensure their ads do not run in his program. Some listeners may remain but only if his affiliates continue to broadcast his show. Many affiliates have reportedly considered dropping the show from their network, which would result in a huge drop in his listener base. Despite Rush’s apology earlier this week, it was reported this morning that U.S. Senator Carl Levin of Michigan is calling for Armed Forces network to stop airing the Rush Limbaugh program. A Raleigh radio station WRDU often noted as “Rush Radio” is getting pressure from a local liberal blogger who created a petition urging the UNC Athletic department to rethink its relationship with the local station, which airs a majority of their sporting events. Free speech does not seem to be the issue here, the fact is, Rush crossed the line in personally defaming someone. Comments that many have claimed were “disgusting” and “derogatory” have stirred up strong emotions in the general public. 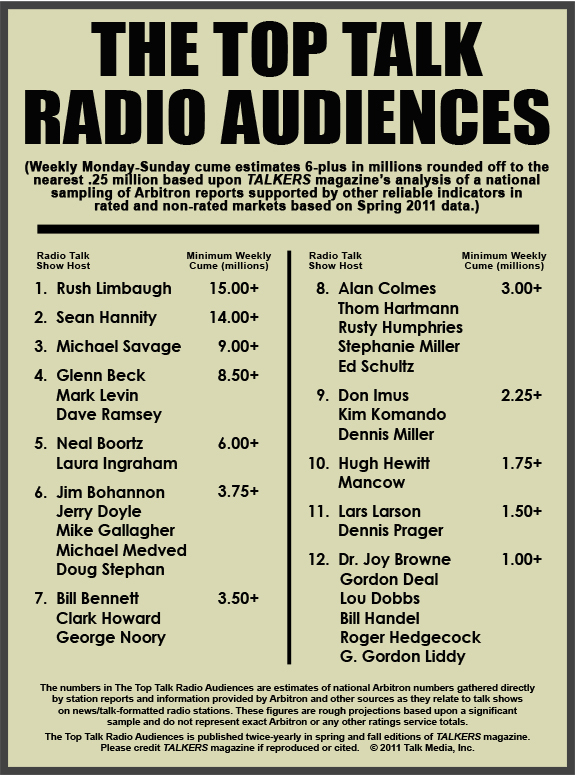 The public, Rush forgot, that are consumers of so many of the advertisers on his program. How can his platform remain without the dollars to support it? As an agency, we have to protect our clients from backlash of consumer boycott and advertisers have to protect their consumer base. If Rush does not stick to offending with his political opinions versus personally offending and defaming people, this could be the beginning of the end. It will likely come down to the listeners; if they continue to support him, the advertising dollars will follow. Bottom line, advertisers want to be where they can reach the most amounts of people. Will Rush survive? They seem to have the confidence by turning away long time partners. Only time will tell how short the consumer’s attention spans will last. As the presidential race heats up, it will only take the next controversy for the public to forget. My prediction: we are nation that is easily distracted and as long as his listener base returns so will the dollars. Media Works along with the rest of world is mourning the loss of Steve Jobs this week. Many are reflective of the impact he made on our daily lives so I decided to reflect upon my own just to discover how significant his influence has been to me. I was very resistant to iPhone/iPod technology and just recently gave up my treasured Blackberry and have entered a whole new world of Apple! Knowing what I know now, I could never go back and I could not be more thankful for Steve Jobs and his inventions. My alarm goes off in the morning (that’s the alarm of my iPhone). After hitting snooze a few times, I grab my iPhone and head out on my morning jog. I take the iPhone to listen to either my iTunes music or stream some new tunes on Pandora. I’m also tracking the time and distance of my run with my Nike sensor calibrated to my iPhone. I get my kids breakfast and send them off to school and I head to work. I check my iPhone for emails. I receive a few emails of newspaper ads and TV commercials that need to be trafficked to media vendors, all of these ads were designed by Apple computers. Next, I sit down to work on a media plan and try to figure out what is the best way for my clients to advertise in today’s media fragmented world. With the introduction of the iPods, iPhones and iPads, traditional media has taken a back seat. How do we reach them now, I ponder and research mobile marketing?! After work and school my kids get home and sit on the couch to watch a movie while I prep dinner. They are watching an old classic, Toy Story, that changed animation forever in 1995, created by Steve Jobs’ company Pixar. My daughter’s 7-year old friend comes over to play and I ask her “Does your mom know you are here?” and she replies, “I will just text her on my iTouch to tell her I’m going to stay awhile and watch the movie”. My iPhone starts buzzing like a gong and it’s my iPhone calendar telling me it’s time to take my son to soccer practice. We head to practice and my husband calls me on my iPhone in the car to remind me to pick up his dry cleaning on the way home. As I am waiting in the car at practice, in my boredom, I take my iPhone out and check my Facebook newsfeed and maybe even play a game of Words with Friends. Before we leave I check the address of the dry cleaner on my iPhone and we use the iPhone map to direct us to the right place. We head home for dinner and the computer is beeping in the kitchen. My in-laws are calling via the Face-time app from their iPad. (Pretty impressive for their generation I might add) The kids say hello to their grandparents in another state and we tell them we have to go to finish dinner and homework. After dinner, my daughter goes upstairs to practice her piano and plays along with the song on her iPod. Steve Jobs’ inventions have touched my daily life in so many ways and the loss of this innovator is tragic. I will use his life as a lesson to teach my children about his forward thinking, visionary approach and what can be possible – the impossible! He created things that we thought only possible on The Jetsons and now they are reality. Who knows what might have been next, I just hope he started working on the iRobot maid because I could really use her! The Japan tsunami happened over a month ago and the effects are still eminent. The auto industry is now beginning to feel the pain of the production slowdown due to the shutdown of their Japanese plants. Though production has resumed at most facilities they are still at half capacity. 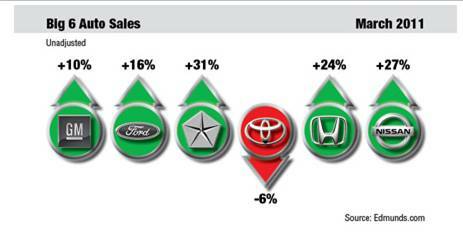 The biggest issues automakers face are parts and inventory shortages. Toyota plants were one of the worst hit and according to the Associated Press, Toyota plants will still be running at half capacity until April 27th and remains unclear when they will return to full production. Honda’s plant in Britain has been running at 50% of planned production since April 11th due to shortage of parts supplied by Japan. Globally, auto manufacturers rely on Japan suppliers for electronic components – integrated circuits, sensors, semiconductors, and the like – and powertrain components, including gears, clutch packs, solenoids and specialty materials. Due to the struggles, Toyota has announced a shift in their U.S. sales goals in anticipation of slowdown from the supply limitations and a slow on the output on vehicles that is anticipated to linger through July. How is this affecting the advertising industry? Media vendors are already beginning to see cancellations from the national, regional and local dealer levels. Cancellations are primarily from import brands for the month of May as dealers are struggling with an inventory crunch. As sales goals are scaled back, advertising budgets are following suit. Effects are predicted to be temporary, General Motors CEO, Daniel Akerson was quoted in the Wall Street Journal as predicting: “I don’t see anything here on the horizon that would materially affect the year,” Mr. Akerson said. “It may affect a month or two.” Only time will tell if the import brands will take longer to recover. The outlook is questionable moving into the crucial spring buying season and somewhat deflating coming off of a strong March when U.S. auto sales indicated a continuing recovery. Edmunds reported a rise in March sales of about 17 percent from a year earlier and also surging ahead by 25 percent from February. All eyes are on April, which is typically not a strong month due to tax season; however this month will now be an indicator of how much the tsunami has really affected results and if more adjustments to the spring marketing strategies will be necessary. Media Works Makes It Big! Media Works is proud to announce the addition of our newest client, The Big Screen Store. They have 13 locations in three markets, Baltimore, Washington D. C. and Norfolk. The Big Screen Store is also locally owned and operated and their retail locations offer brand name HDTVs from 42″ to 85″ in size. In addition to TVs, when you shop at The Big Screen Store, you can build your own home theater that is complete with a sound system and a large selection of cinema style furniture. They will even match competitors’ pricing and include installation of their products with great service. Media Works is excited to help Big Screen implement new media strategies in their markets and help a local business compete against the large national big box chains. We are implementing a male-targeted plan that includes sports marketing on television and radio, interactive, as well as new media strategies in all their markets to kick off the 4th quarter retail season. Media Works launched Big Screen’s first Google search engine marketing campaign and quickly saw click through rates that are 3-4 times higher than the industry average. More importantly, when Media Works combined the search campaign with a targeted television campaign for Big Screen’s Labor Day sale, we saw a significant boost to the results. Using Google SEM combined with our television strategies, Media Works has managed to drive thousands of qualified, interested visitors to thebigscreenstore.com in a very short time. Beyond just running spots and digital ads, Media Works is helping The Big Screen with promotions that combine digital and traditional media. Media Works helped facilitate a brand new promotion with ESPN 980/Redskins Radio in Washington D. C. called the “Big Screen Score Contest”. Listeners can register their prediction for the score of the next Redskins game online to enter to win a complete home theater system. The Big Screen Store is engaging its potential male consumers through traditional radio and asking them to actively participate for a chance to win their products. Media Works’ strategy of using a traditional male broadcast vehicle is helping drive traffic to Big Screen’s website and in turn helping us evaluate success of the promotion and ROI through digital vehicles. We have coordinated similar sponsorships with the Baltimore Ravens for the Baltimore market and are also using Monday Night Football and broadcast NFL television games to reach consumers that are home watching THE reason they want a bigger, better TV: Football! Media Works understands the importance of helping clients reach their target creatively through multiple media outlets and it is our big media ideas that are generating big results and maximum exposure for The Big Screen Store! Through an extensive RFP process, Media Works was recently awarded a contract with the Florida Department of Elder Affairs to help them increase awareness of their SHINE (Serving Health Insurance Needs of Elders) program. We were excited to travel down to Tallahassee to meet their team and we are honored to be working with such a sharp and talented group. SHINE is a government program that counsels Medicare beneficiaries about the available assistance for paying Medicare prescription drug costs. Due to Media Works’ extensive work with Erickson Retirement Communities and experience targeting the elder market, we were awarded the project. We are placing broadcast and print media throughout the state of Florida and our strong negotiating skills delivered above and beyond the client’s expectations. We increased the planned television weeks in their primary and secondary markets and delivered a strong direct response TV campaign. Media Works expanded the radio coverage into additional markets and secured one for one bonus ads and spots from most media vendors. Media Works has extensive experience in this category and knows the best media strategies for targeting mature audiences. This recent win with the Florida Department of Elder Affairs and their confidence in our planning continues our proven success in this category. Charlotte, North Carolina: the “New” City; the “Next Atlanta”; the Queen City, and the “never to be compared to Raleigh because we’re better!” city. Charlotte is a city that has nearly doubled in size in the past ten years. It has a blend of newcomers from Ohio, New York, Florida, South Carolina and a new cultural blend now made up of northerners, southerners and one of the fastest growing Latino populations. What does this mean to the businesses of Charlotte and the local advertising world? Advertisers need to understand the changing make-up of the consumers they are speaking to. Who are the newcomers and where do they live? They also need to understand not only the changing landscape of the city but how to reach consumers in the new landscape of the media and digital world that surrounds them. The growth of the city has changed the broadcast media world of Charlotte in two major ways. The first change is the ranking of the Charlotte DMA market by Nielsen. In 2007, Charlotte’s population rise caused Nielsen to announce Charlotte as one of the top 25 DMAs in the country, surpassing Indianapolis and San Diego. Big deal, right? More people means more traffic! To local advertisers it should be a big deal. To them it means that now national advertisers are recognizing Charlotte as a major city. More national businesses want to sell their products to this market and as they spend their advertising dollars here it will put pressure on television inventory and drive up broadcast rates. This dynamic must be understood by businesses and their advertising agencies as it will make it tougher for local businesses to compete.